A range of classic Wurlitzer jukebox models all available to view in our Bristol showrooms. Free delivery and installation. Finance available. We stock a range of Wurlitzer jukeboxes in our showroom: some of the most iconic jukeboxes of the 20th and 21st centuries with some of the most fantastic sound. Wurlitzer was founded in 1853 in Cincinnati, originally a producer of musical instruments, before moving on to manufacture coin-operated pianos in the 1880s, and then jukeboxes in the 1930s. During the late 1930s and throughout the 40s, Wurlitzer made some of their most iconic models, despite being limited to such materials as wood and glass, as there were restrictions on using metal and plastic in large quantities during the war. The iconic wooden carved cabinet and innovative designs by Paul Fuller made Wurlitzer one of the top competitors in jukebox manufacture for the next three decades. 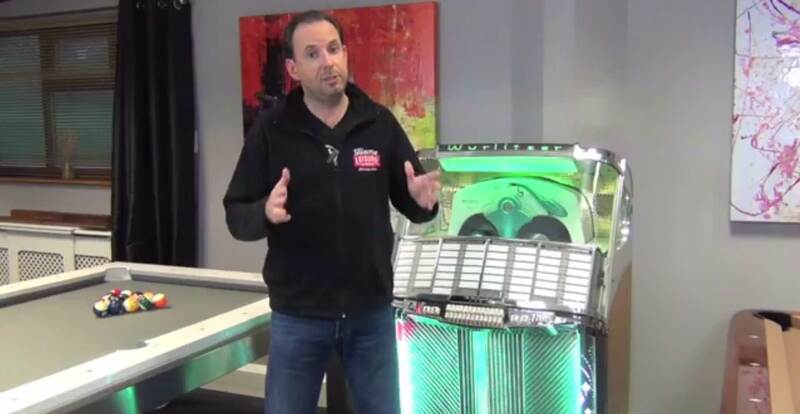 Jukeboxes are enjoying a comeback due to renewed interest in vinyl records and vintage style products, and Wurlitzer have been at the forefront once again. Whether you're looking for a classic jukebox from the golden age, or a CD jukebox to play the most modern music, Wurlitzer has you covered. Wurlitzer have produced some of the most exciting top quality jukeboxes in the world, made from the best materials and modelled on classic designs. These fantastic machines are not only made to match the look of the originals, but are also made to mimic the original rich sounds of the tube amplifiers. Encasing 6 speakers in a three way stereo system, this commercial standard sound system has a fantastic tone and completes the authentic feel of these retro beauties. Wurlitzer’s most iconic model, the 1015 made in 1946, sold over 50,000 units in the first 18 months of its release. With its intoxicating coloured lights, bubble tubes, wood finish, stylistic grill and 24 record changing mechanism, it was an instant hit and remained to be one of the most iconic designs of the era. This design is still very popular today, with new models being sought out to play CDs instead of vinyl records. This classic look married with the ease of technology helps to bring any room to life. We are passionate about jukeboxes and our staff are highly trained in all aspects of our new and vintage models. They look really striking in the flesh, so give us a ring to see if we have some models currently on show in our Bristol showrooms. Our staff will be able to advise on the best jukebox for your requirements.